Sexism in Football – Move. Run. Sports. Massive headlines have been made since the weekend, when Andy Gray and Richard Keys were caught off air, yet their microphones still on and had been recorded talking about Sian Massey a female who has reached the top in officiating in the game of football. 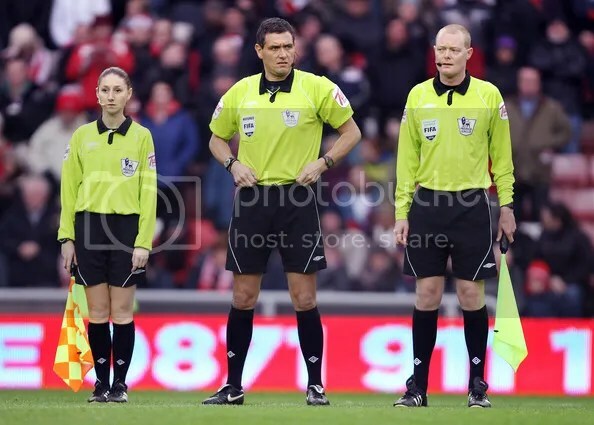 Before she took to the field as a referee’s assistant in the Wolves v Liverpool game, Gray and Keys were caught mocking the female referee and that someone should go and explain the offside rule. Ironically, Massey got a massive decision correct which left everyone else needing the TV replay’s in order to see it! This was the second premier league game in which Massey has ran the line. A fantastic achievement at the age 25, and such a role model to women in the game. It can be done and you can reach the top! But what also comes with being a woman in football is the sexism from men who think the game is theres. That they know the game much better than any woman, which is so far from the truth now. Women exist in football in all types of roles. From players to coaches, officials to being on the board in clubs. This leads onto the other woman insulted by Gray and Keys, Karren Brady. Who has been a major force in football for many years now starting out as the managing director at Birmingham City FC and more recently moving to West Ham and becoming vice-chairman. Showing that women can be influential in top football clubs in England. Andy Gray was sacked from Sky Sports yesterday after another video appeared. Richard Keys appears to be hanging onto his job at the moment, although another video featuring him appeared last night. Whilst I think they should have been judged on the comments aimed at Massey and Brady the other day, bringing up older videos/comments is turning it into a bit of a witch hunt. Someone really is screwing them well and truly over. In some ways this might really help women in football due to highlighting the fact that sexism is still rife within the game. I took the comments personally, maybe too personally but I have had to deal with sexist comments throughout my entire life, just because I have always played and loved football. It was something you just had to learn to live with, but still hurt at times. Obviously everyone knows it is still a very male dominated environment you just have to go on a coaching course to see that, especially when you get further up the ladder. On my level 3/UEFA B course only one other female coach was on it with myself. You feel as though you have to work twice as hard to prove yourself, as some men are still not convinced that women know the game as well as they do. Are some men threatened by the presence of women in the game? Especially when they can do the job just as well as men. That is a massive possibility! But another massive plus has been the amount of men in the game who have backed women playing a role in it all over the past few days. Now lets hope this saga runs its course and women can just get on with being in the game!